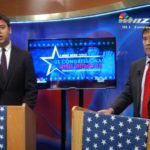 Republican Congressman Troy Balderson and his challenger, Democrat Danny O’Connor, met in their only debate last night and it was a ton of fun. The moderator sat passively, while O’Connor took control of the exchange. The result: an hour of fiery back and forth, with candidates sparring on issues ranging from healthcare, the opioid crisis, taxes, jobs and the future of Medicare and Social Security. O’Connor was in command throughout, peppering Balderson with questions during his responses and drawing him into conversations Balderson definitely didn’t want to have. When given the opportunity to ask O’Connor a question, Balderson brought up his out of state fundraising, allowing O’Connor to rapidly pivot to Balderson’s reliance on corporate special interest money. One of the most unreal exchanges featured O’Connor challenging Balderson on how he could claim not to be taking away people’s healthcare when he supported an end to the Medicaid expansion (which hundreds of thousands of Ohioans rely upon). Now we know why Troy didn’t want to debate.